The NTF hosted out of town guests/patrons for the BB&T Atlanta Open and tennis clinics at the South Fulton Tennis Center. Guests were treated to exception tennis from top American players including John Isner, Jack Sock, Ryan Harrison and the Bryan Brothers. Clinics were organized by Sam Kennedy, NTF Atlanta Chapter President, and over 20 kids from his leadership program. Dates are already being set for the 2018 Atlanta Retreat. Please join us…. 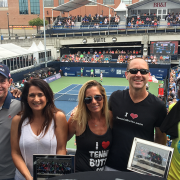 You are invited to join us this July 28 – 30th in Atlanta, GA, for a fun and inspiring weekend of travel, tennis and charity. 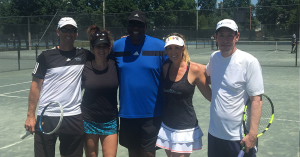 Each year the National Tennis Foundation invites tennis lovers out to tour their Chapter Organizations, in the spirit of inspiring and transforming at-risk youth. This year’s gathering will be hosted by the South Fulton Tennis Academy, the NTF Atlanta Chapter. The gathering promises to be a mix of pleasure and purpose, reflection, and relaxation that you will not forget. During your weekend stay, you will enjoy the many sights and sounds that are Atlanta, attend the BB&T Atlanta Open, and get to tour and meet many of the children/ambassadors of the South Fulton Tennis Academy, the Atlanta Chapter of the National Tennis Foundation. We look forward to welcoming you to Atlanta this July. The South Fulton Tennis Center, the Atlanta Chapter of the National Tennis Foundation. Rates of $159 (ATP Event Discount) will be offered on a first come first serve basis. If we run out of hotel inventory at this rate, prices will go to standard market rates as listed on the website. *All pricing is at cost. Air, Food and Beverage not included. In exchange, we do ask that you kindly consider making an optional donation or directed grant to South Fulton Tennis Academy, the Atlanta Chapter of the National Tennis Foundation, after your Atlanta Experience.